I love a recipe that cooks in just one skillet. If that recipe is easy to make and takes about a half hour then I’m obsessed with it. 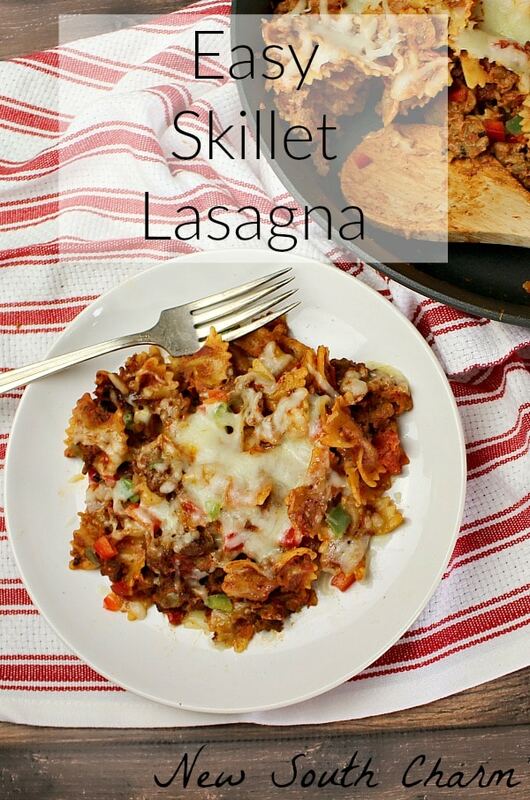 This recipe for Easy Skillet Lasagna is currently my number one recipe obsession. Things around here have been crazy lately. It seems like every time I turn around my to do list is longer and I have less time to get it all done. So lately I’ve been really looking for and cooking recipes that are fast, easy, and convenient. 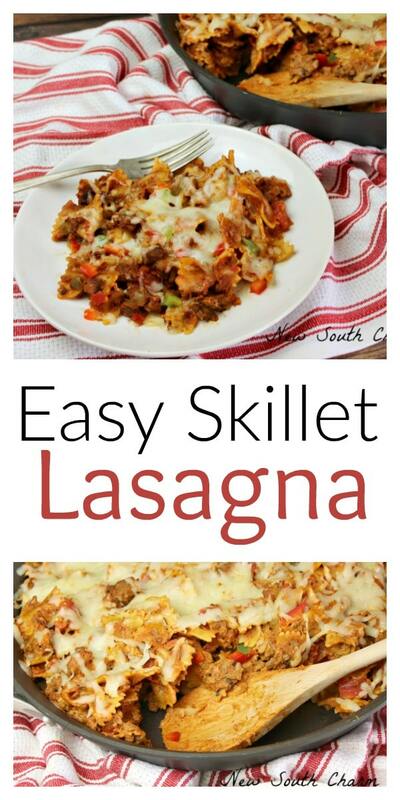 Easy Skillet Lasagna is one of those recipes that you’ll find yourself making again and again. It is really that yummy. I admit I had my doubts that anything you made in a skillet could have the warm, rich flavor of lasagna but this recipe really does. 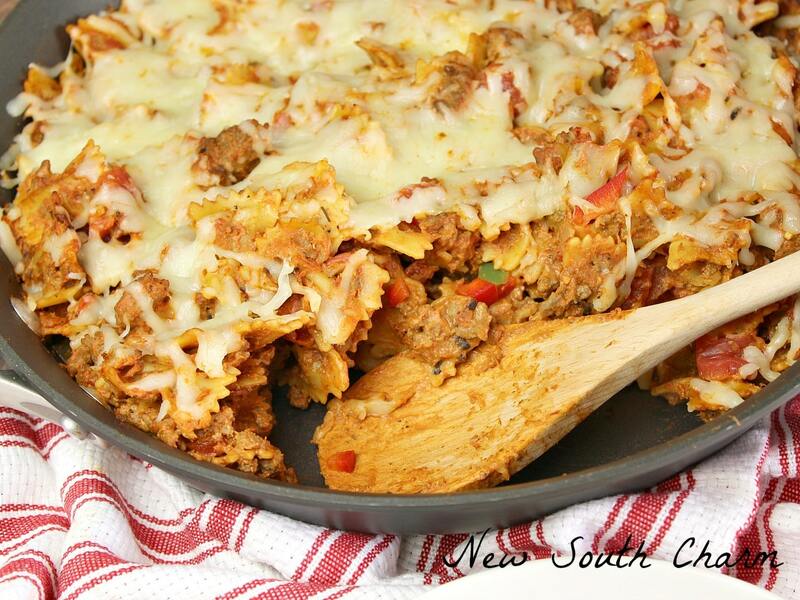 To make this recipe you will need a large skillet. I used a 12 inch that’s pretty deep. If you don’t have a skillet that big you could use a dutch oven or stock pot. In a skillet over medium high heat brown ground beef until it is no longer pink. Drain off excess fat and return the skillet to stove. Add chopped onions and peppers to ground beef and cook until they are tender. Once vegetables are soft pour in a jar of marinara sauce. I used a chunky style sauce. Next, season the mixture with Italian seasoning, garlic powder, red pepper flakes, salt and pepper. Stir until all ingredients are well combined. Bring the mixture to a boil then add pasta. Reduce heat and cover. Cook for 15 minutes stirring occasionally to prevent sticking. At the end of 15 minutes the pasta should be cooked through. If the pasta is not completely cooked cover again and cook for another five minutes. Stir Ricotta into pasta then sprinkle Mozzarella over the top. Replace lid on skillet and wait a few minutes for cheese to melt. If you are using an oven safe skillet you can pop it under the broiler for a couple minutes until cheese is melted and bubbly. 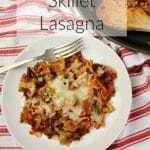 Serve Easy Skillet Lasagna with a green salad and a loaf for crusty bread and you’ve got a great meal for the whole family. In a large skillet over medium high heat brown one pound ground beef until is it no longer pink. Drain excess fat and return skillet to stove. Pour in marinara sauce then add Italian seasoning, garlic powder, and red pepper flakes, salt and pepper stir to combine. Sprinkle Mozzarella on top and replace lid for a few minutes while cheese melts. If your skillet is oven safe you can place it under the broiler to melt the cheese. Don’t forget to check out all the other great recipes from my fellow Sunday Supper bloggers. Special thanks to this week’s host Liz of That Skinny Chick Can Bake. I know my family would love this. Now I can give them lasagna during the week. I tried to make a skillet lasagna without a recipe to guide me—it was just ho hum. I need to try yours!!! 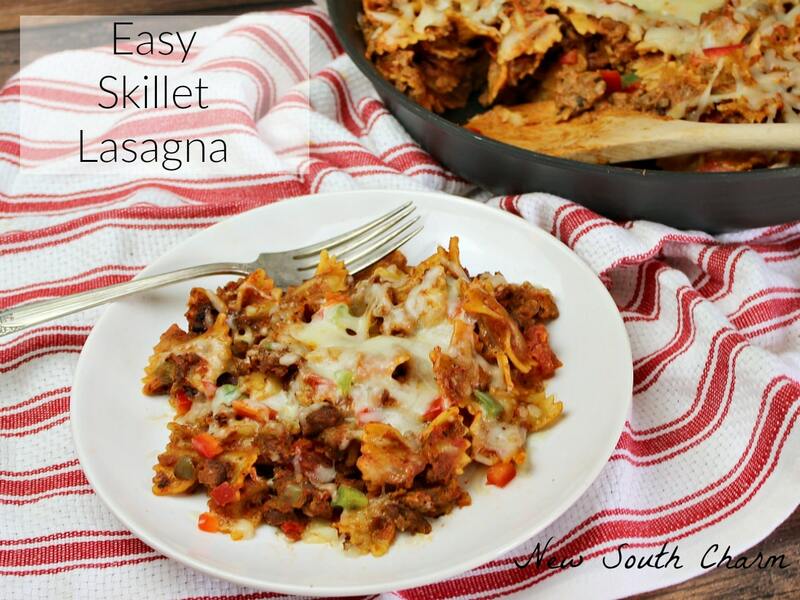 Your Skillet Lasagna looks awesome, a great meal for Sunday Supper! Hope you are having a great weekend and thanks so much for sharing with Full Plate Thursday.